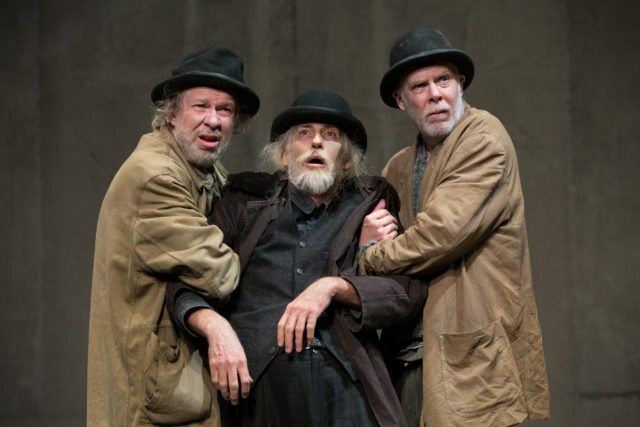 Left to right, Diego Matamoros, Rick Roberts, and Oliver Dennis in a scene from Waiting For Godot. Photo by Cylla von Tiedemann. So the draw for any production of Beckett’s signature work is who’s involved, and in casting Diego Matamoros and Oliver Dennis as Vladimir/”Didi” and Estragon/”Gogo” respectively, director Daniel Brooks has put two of the company’s most stalwart and popular members together to play, quite literally. There are moments when the two tickle each other, and engage in childish one-upmanship, pretending to shoot guns at each other, and bickering incessantly. “Nothing to be done,” they often say, but as they ceaselessly seek to engage each other—even in questioning how best they might kill themselves—they find endless things to do. Enter Pozzo (a charismatic and constantly shifting Rick Roberts), dragging his abused and enigmatic slave Lucky (Alex McCooeye) behind him on a rope. Pozzo and Lucky are nothing if not engaging to Didi and Gogo, and to us. The dynamics of the four, despite the pauses and seemingly casual chatter, are often tense. A second act appearance, with their situation significantly altered, also passes the time, which Gogo and Didi experiment with almost callously. A fifth character, the Boy (Richie Lawrence) arrives at the end of the two acts (or perhaps, every infinite act) to inform Matamoros’s Vladimir that Godot won’t be coming today, “but surely tomorrow.” We know by now that tomorrow never comes, but there’s so much to parse from today, or yesterday. Spending a few hours in the company of these weathered survivors gives us perspective on what there is to be done. To October 14, Young Centre For the Performing Arts (50 Tank House Lane), various times, $25-$95. Click here for the third review in this series, North By Northwest.